The list of topsoil uses is quite extensive. It can be used to build gardens, fix lawns and make drainage better. No industry standard exists to define topsoil by its contents, so matching new topsoil as closely as possible to existing soil is important to prevent plant-growing problems. Before you purchase a load or tear open a bag of topsoil, check with the seller to learn its ingredients. 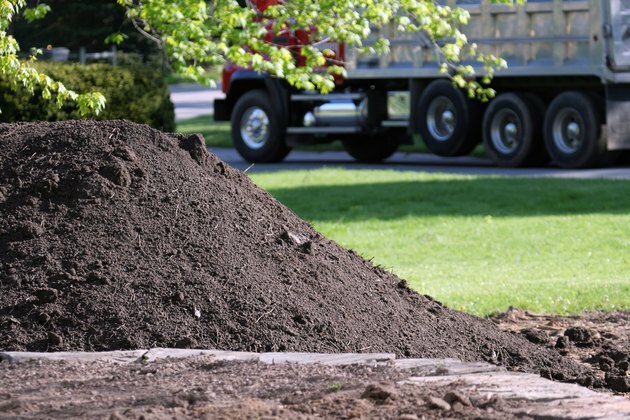 The topsoil that is sold in bulk is usually from the top 5 to 6 inches of soil scraped from Earth's surface. So what bulk topsoil is made up of depends on where it was taken and whether or not the supplier supplemented it with other materials. It may or may not have had fertilizer, lime and organic matter added. Whether it is made of primarily sandy or clayey soil, or contains considerable amounts of weed seeds, depends on where it was scraped. In comparison, bagged topsoil has had fertilizer, lime and organic matter added. Topsoil can be used to make a garden by spreading a 2-inch-thick layer of it onto a selected area then mixing it thoroughly with the existing soil to a depth of about 4 inches. Because there may be a big difference between topsoil and your garden soil, mixing it with the top 4 inches of your soil creates a transition layer that prevents drainage problems between the two soil types. After the soils are thoroughly mixed, add topsoil on top of their layer to make the garden the desired depth. Using a topsoil that has had fertilizer and organic matter added leads to the best results in plants. Topsoil can be used to fill low areas of lawn to make the yard level, and it can be used to top-dress bare spots. Fill a low area of grass by adding a 2-inch-thick layer of topsoil on top of it and leveling the topsoil with a shovel. The grass will grow through the new topsoil. If the depression is more than 2 inches deep, repeat the process several times. Adding large amounts of topsoil, however, can change the existing soil's structure and pH, or acidity, level, possibly making it unsuitable for the current grass type. Fill a bare area in your lawn by spreading a 1-inch-thick layer of topsoil over that site, broadcasting grass seeds there and working the seeds into the topsoil with a rake or hand tiller. Follow those tasks with daily watering, and new grass should sprout in one to two weeks. Incorporating topsoil into an area of lawn or a garden that tends to hold water improves the location's drainage. Use a sandy topsoil combined with organic matter, such as compost or ground pine bark, and till it into the existing soil to a depth of 12 inches to create good drainage in the root zone area of plants. Do not disturb plants' roots during the process, however, or remove plants before you revise the existing soil and replant them afterward, or revise the existing soil before you put plants in the site. Because adding topsoil can change soil's pH level, use a soil test to find whether or not the pH needs to be adjusted before you plant grass or other plants.